I’ve known Vesta Johnson since 1977, played tunes with her at her home and on stage, learned from her, and consider her a friend and mentor. She has likewise been a friend and teacher to countless other old-time musicians over the years. I interviewed Vesta at her house last winter, but our visit seemed more like a conversation with an old friend than a formal interview. You know, both of my folks played. My dad played pretty much all the square dances in the neighborhood. But there was a cousin of my mom’s, he just stayed around different places out in the country and worked during the winter, just fixing fences, or [doing] chores or whatever. He had an old fiddle, and he wasn’t a real good fiddler. I brought home those Christmas seals, a sheet of them, and, of course, back in the ‘20s there wasn’t no money. People didn’t have money. But he had worked during the summer following harvests and corn-husking in Kansas. He said, “I’ll buy a dollar’s worth, but you got to learn to play the fiddle.” Well, he taught me; he got me off in a corner of the room and taught me “Golden Slippers.” And that was all the teaching I ever had, actual teaching. And I learned “Golden Slippers,” and I took that dollar to school. Vesta Johnson was born in 1922, in Linn County in North-central Missouri. While she was growing up, her family had no radio or phonograph, and no electricity, so they made music to entertain themselves. I lived rural. [Music] would be at your place one Saturday night and my place the next Saturday night, and it would just make a circle in the neighborhood, a dance in their house. And, of course, us kids was little, it was in the ’20s, early ’30s, and we always went. There wasn’t no leaving us home, no babysitters. We went as a family; you done everything as a family. And, I guess, 1 just lived with it, heard it. I danced when I was seven or eight, ten. I was nine years old then when my dad said, “Here, play the next square. ” And I remember playing “Tennessee Wagner”… The only thing I ever heard my dad say to me [about how to play] was, when you go down high on the strings, take it kind of easy. Don’t bear down too hard. When asked about other fiddlers who have influenced her, Vesta will cite lots of players from Missouri and other parts of the Midwest whom she met in later years, such as Dwight Lamb, Cyril Stinnett, Lee Stoneking, and Frank Reed. But she says in her early years there weren’t too many around her area. And then my dad played over the store. It was just an old general merchandise. One-half of it was groceries and the other half was dry goods, in the back was farm stuff. When the store closed at nine o’clock on Saturday night, they opened up the upstairs. The stair steps went up the middle and the stage was right there, and they danced all around…. I heard them say one night they had 16 squares, no sound system, [just a] fiddle and guitar. There was a piano on the stage, if someone could play piano. My mom played piano sometimes, just chord with the music. And a caller, they had one caller…. They could call a square that you could hear to that next street down here. That’s the way I heard it all my life. Very few fiddlers…. Most of them had a horse and wagon and they didn’t travel very far. If one came through, might have a new tune, and somebody would learn that tune. About 1938 or ’39, my dad always wanted to go to the Ozarks, so he packed up and bought a place down there. And I lived down there and went to high school at Summersville (Texas County). After he got down there…, we was kind of living in a Baptist religious part of that county and they frowned on that fiddle…. [For dances] you had to go quite a little way into Houston. Houston Reunion they always called it. It’s just a big county fair. They would have a dance floor and would dance there, because it wasn’t in that area where we lived. Or Raymondsville, they had a dance floor at their little picnics. For a while Vesta went back up to Livingston County to care for her ailing grandmother in Chillicothe. Though her grandfather didn’t play, he did have an old fiddle she could use, and there were other musicians nearby. …Before I was married, [I] played school parties and pie suppers and things. And there was two boys up the road, the Hooten boys, one played jug and the other one played guitar. In 1940, after moving back to Texas County, Vesta married Steve Johnson. For a few years she didn’t have a fiddle she could use, but when Steve returned from Japan after service in World War II, he brought Vesta a fiddle. This was the first fiddle that she could really call her own. Steve and Vesta moved to Kirkwood (St. Louis) around this time, and she has lived there ever since. Though Steve was always very supportive of her music, Vesta didn’t play much for most of the time she was raising a family — like many a fiddler. In fact, for about twenty years, she played only a little for her family. 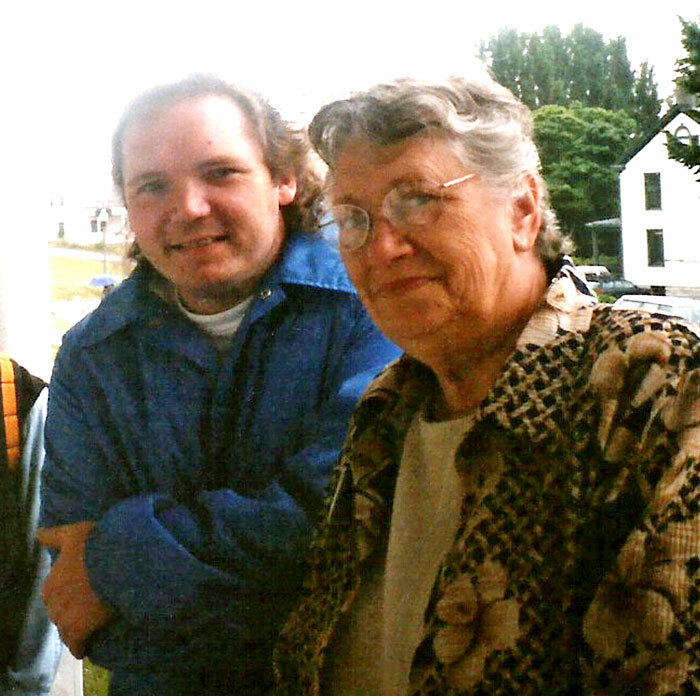 In the 1960s Vesta began attending fiddle contests and met some of the younger, aspiring old-time musicians in the St. Louis area. I went to a lot of contests, and I wouldn’t give you two cents for the contests — but I wouldn’t take a lot of money for the people I met and the tunes I heard. Before long, the Johnson house became the center for jams every Saturday night, and sometimes on Fridays too. 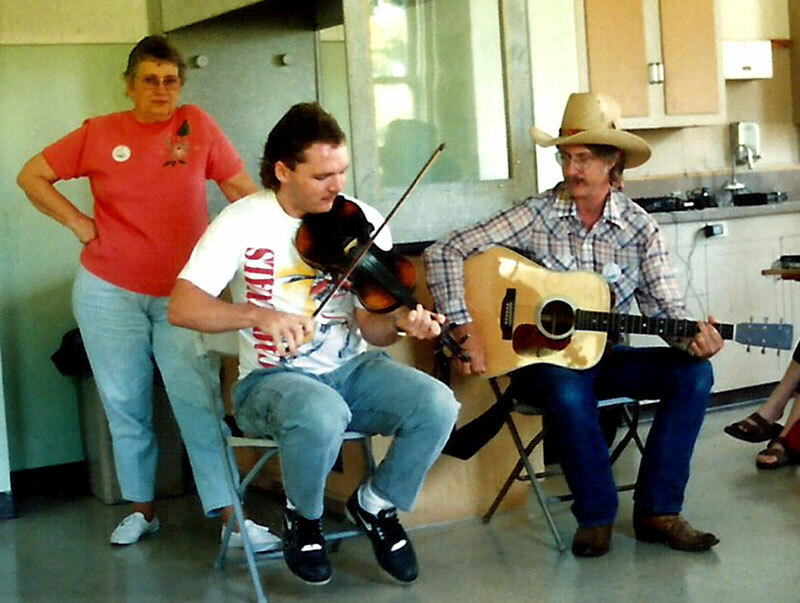 These get-togethers continued at the Johnsons’ until they “[ran] out of room.” Vesta and Steve and a few other people then formed the Missouri Fiddlers and Country Music Association (MFCMA) in 1974, an organization that’s still going strong and holds monthly Sunday afternoon jams at the Kirkwood Community Center. Vesta would like for the jams to be all old-time, but in the various rooms you might hear bluegrass or acoustic country-western music as well as old-time fiddle tunes. The MFCMA has run a stage for about thirty years at the Green Tree Festival in Kirkwood in mid-September. Vesta sets up the stage acts, some country and bluegrass, but the audience “wants old-time fiddlers” and she still helps satisfy the crowd. 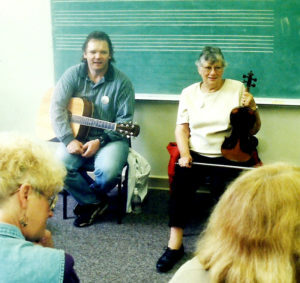 Vesta has taught fiddle lessons for many years, currently to eight students, and often through TAAP, the Traditional Arts Apprenticeship Program from the Missouri Cultural Heritage Center and the Missouri Arts Council. Primarily she teaches adults, from bare beginners to players like Bill Martin, who took up fiddle after playing violin for over thirty years in the St. Louis Symphony. 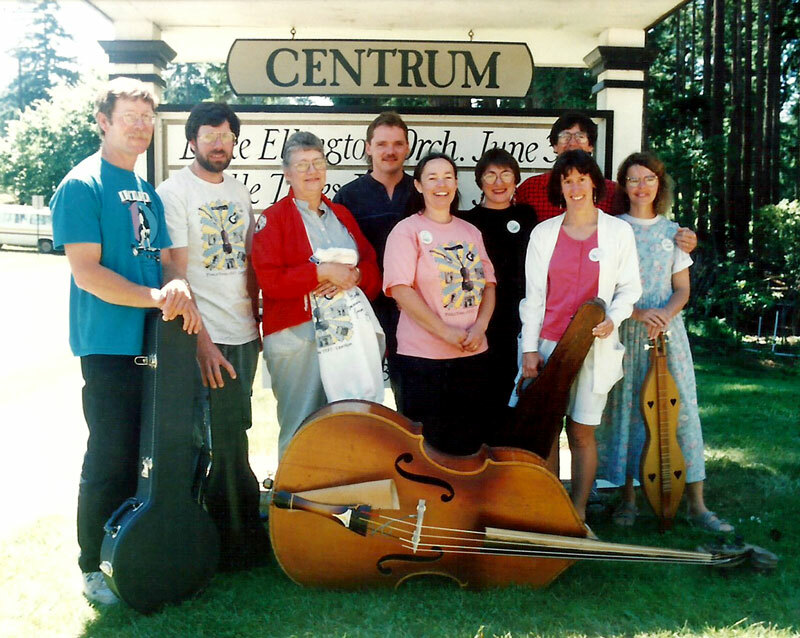 For the last 23 years Vesta has also participated in the Bethel Youth Fiddle Camp as a master fiddler. The camp is held each June in the historic German colony of Bethel, in Northeast Missouri, and is limited to about 30 or 40 students ranging in age from seven to 17. Around 10 masters teach old-time fiddle and guitar, concentrating on Missouri styles. Vesta still considers herself primarily a dance fiddler; however, she doesn’t get to play as many dances as she did in past years. Around St. Louis, contra dances seem to be the current favorite, and Vesta says she doesn’t play for those because “I’m that crooked fiddler.” But when she does play square dances at places like Bethel or the Festival of American Fiddle Tunes in Port Townsend, Washington (an event at which she has twice been featured), she’s in her element. Although she has worked with many accompanists, for many years now her backup musician of choice has been her grandson Steve Hall. He’s not only a terrific guitarist and mandolin player, but also has served as a master fiddler at Bethel. In the last few years the two have performed at the University of Chicago Folk Festival and the Bluff Country Gathering in Minnesota, among other appearances. Steve’s son James is now fiddling, learning tunes passed on to him by his grandmother. The cousin from whom Vesta first learned to fiddle was missing a finger on his left hand. As a result, Vesta has always played without using her little finger, sliding her third finger up to get notes that would be played with the fourth finger by most fiddlers. That’s given her a very distinctive style — often bluesy, and highly danceable. Even her tunes that seem simple and straightforward are deceptively difficult if a player really wants to get her sound. Bob Bovee is a longtime contributor to the OTH, writing both articles and reviews. He and his musical life partner Gail Heil have played old-time music for a living for more than three decades, and have learned from and performed with Vesta Johnson. These last two recordings may be purchased directly from Vesta or from Steve Hall (stevehallstl@yahoo.com).